Opening a lead insulated buried cable. Lead can be resealed with solder after repairs. In the early to mid-1950’s, thousands of landowners between Houston and Dallas/Ft. Worth, Tex. were asked to grant a right of way and easement to what was then known as the American Telephone & Telegraph Co. (AT&T). After winning permission, AT&T buried a 4-6 inch wide copper telephone cable sheathed in lead to connect the two cities — 200 miles apart — together. Almost 70 years later, that cable is coming back to haunt the phone company. Telecommunications companies have used copper phone wiring for over 100 years to deliver telegraph, telephone, and data services. AT&T’s “trunk lines” often contained dozens, if not hundreds of individual cable pairs used to connect regional long distance calls and distant central switching offices together. To protect the cables, phone companies relied on simple paper insulation until the mid-1950s to keep the cable pairs from making contact with other wires. Buried cables were traditionally sheathed in lead, a very popular and durable insulator that dependably kept moisture out while allowing technicians easy access to the cables within. As the 1960s approached, phone companies began to switch to plastic insulation, but paper and lead-wrapped copper wiring remains in service in some areas to this day, often in large cities. As with most AT&T-owned underground cables, the one in Texas was wrapped in lead. The company used a network of subterranean concrete rooms and above ground small cinder block buildings for maintenance, offering technicians direct access to the cable and various network equipment. Landowners knew the additional infrastructure belonged to AT&T because the company placed their logo on it. Ongoing technological advancements eventually allowed AT&T to transition service to fiber optic cables, and by 2010, the Houston-Dallas copper cable was decommissioned. AT&T employees removed its signage, sold the cinder block structures and abandoned the underground vaults. But AT&T did not remove the cable, which remains unused and buried to this day, allegedly leaching dangerous lead into the ground. Property owners fearing AT&T’s cable may be fouling the soil and groundwater with lead contamination took AT&T to court in 2016, seeking a class action case against the phone company for abandoning its cable and easements. Some older metropolitan areas may still have over 50% lead cable. Buried cable leaches many compounds to the surface of the insulation: lead carbonate, lead monoxide, lead sulfate, lead chloride, lead dioxide, lead acetate, lead nitrate, and lead sulfide. Many of these compounds do not adhere tightly to the cable and are easily airborne. Once in the soil, 83 and 98 percent of the released lead remains intact in the soil within 2 inches of the cables. 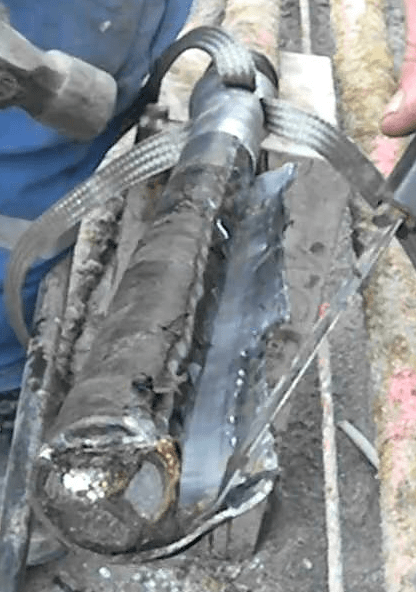 Extraction of cable from underground duct can release unexpected high levels of lead dust. Wetting was not capable of controlling dust in many cases. Location of employees to cable extraction is important. Despite the health risks, a judge denied class certification of the lawsuit on Tuesday, ruling each affected property owner will have to bring a separate lawsuit against AT&T. U.S. District Judge Alfred H. Bennett issued the 11-page ruling against the claimants. Bennett was also unpersuaded by claims that the abandoned AT&T cable created a presumption of imminent harm, and his ruling stated each property owner would have to provide evidence of the cable’s lead contamination on that owner’s land. In addition, each claimant would have to prove damages, assuming the statute of limitations had not run out years ago. “Certainly, a separate soil analysis for each property would have to be present, along with evidence pertinent to determine the existence and cause of any contaminates on each of the properties,” Bennett wrote. The law firm bringing the lawsuit plans an appeal. This could be interesting to see how this plays out. Lead cable is everywhere, some still in use and some left in place. Correction MOST left in place. Lead is not an insulator! It is used in the connective parts and plates of car batteries among others. The rest is correct.